What does a choir do when the power goes out in the middle of performance? Why keep on signing, of course! That’s what happened to the Choral Waves choir at the Cochrane Music Society concert last Tuesday. Riverside Jazz had just finished their performance, and the choir was in the middle of their first song, when a lightning strike caused a power outage plunging the Cochrane Alliance Church sanctuary into inky blackness. 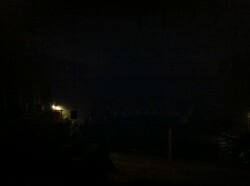 Choral Waves sings through power outage at Cochrane Alliance Church Tuesday, May 22, 2012. The choir didn’t miss a beat! Audience in the balcony quickly pulled up the blinds at the back to let in some remaining evening light and the choir who always memorize all of their music carried right on. Band members in a side room scrambled to find a battery-operated stand light for Noah Borin, the accompanist, and he played through without a hitch. It was a testament to the CMS confidence in their director, Rob Billington, that it didn’t occur to anyone to provide light for him! It was almost fitting that the choir sang most of their repertoire in the dark as the Cochrane Music Society was raising funds at the concert to support the BVHS Night Commute Fundraiser. Thanks to all for donations that raised $640.10 toward this worthy cause. Just before Choral Waves’ last song, power was restored and Band on the Bow concert band set up and completed the concert for a very appreciative audience. The CMS Choral Waves and audience will always remember the concert the night the lights went out! Riverside Jazz are hosting the upcoming Big Band Dance, June 9th at 7:30pm at the Cochrane RancheHouse. Dance away the evening to popular jazz and rock tunes by your own community bands including the BVHS jazz band, Phat Young Cow, and Midnight Blue from Calgary. For tickets call 851-5556 or 932-2677.